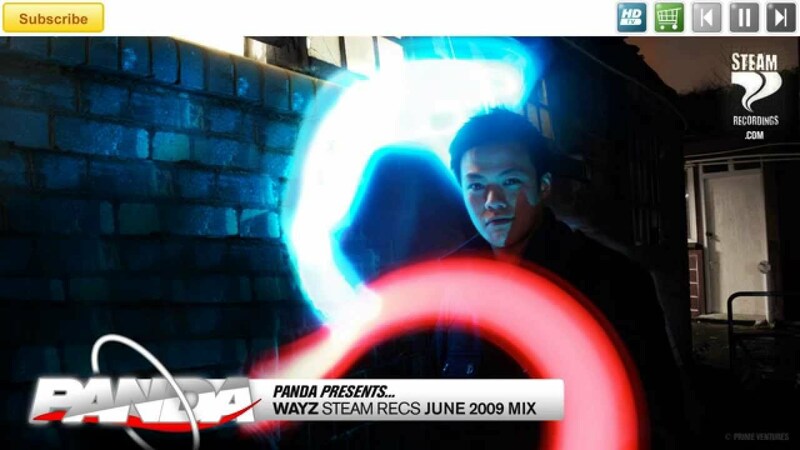 Panda presents WAYZ Steam Recordings June 2009 Mix. The Drum & Bass producer that is just off launching his first imprint STEAM Recordings along with fellow producer SIDIUS and releasing the killer EP "Waking The Dead". He brings us a selection of his latest tunes blended in top speed in just 20 minutes. Leave your appreciation in the comments! WAYZ was first introduced to the Drum & Bass scene from the early Jungle days. Initially a keen RnB / Hip Hop listener he strived for a more energetic and progressive style of music. Keen to progress with the music Wayz developed an interest for mixing from hearing the likes of Kool FM & Rude FM and was shown the ropes from a close friend. His mixing talent developed and was later afore mentioned on Mixmag magazine during a talent showcase on Kool FM. From that point Wayz played at various venues across London, Playing both RnB / Hop Hop and D&B gigs, Camden Palace, SW1, Leisure Lounge and The End to name but a few. Taking time out to study Digital Arts at University, Wayz began to develop projects that involved strong reference to D&B, from this point music production was inevitable. Since then Wayz has concentrated on production and continued to develop a fast paced dance floor orientated style. Always striving for progression and quality and looking to be part of and contributing to the scenes ever changing sounds. Wayz has been featured on Drum and bass Arenas podcast which caught the attention of Breakbeat Kaoss DJ Fresh, in turn leading to the subsequent signing of Beyond to the high profile Dogs on Acid label. His tracks have also been featured on; Knowledge Magazine, Radio1, 1xtra, BBC Asian network and now has play support from some of the scenes top DJs. Following a handful of successful releases WAYZ has decided to launch his own imprint, Steam Recordings, with good friend Sidius. Steam Recordings, born out of the shared desire of WAYZ & Sidius to bring something new to the dancefloors of the world. A style to incorporate the energy and hooks of dancefloor Drum & Bass with the relentless, rolling tear out sound of techstep. A long time coming, but still ahead of the game. Steam Recordings has landed.